After a frigid nights the morning were always welcome. Warming up and getting a good hot breakfast, discussing the days endeavors and witness plenty of shenanigans was the best way to start the days. Our first few climbs were in Buttermilks and exploring these new zones and to me, completely new places, is something I will never forget. 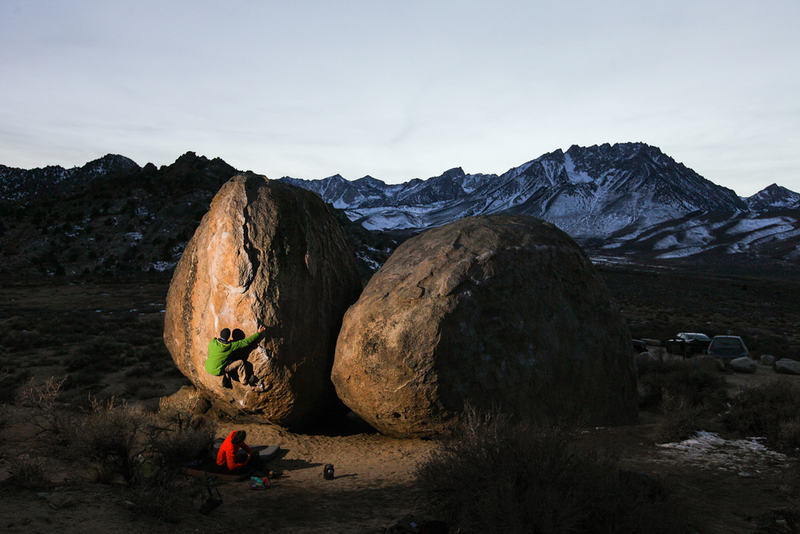 We spent the first day exploring the Buttermilks, the area renowned for its highballs and views. Arriving with a book of trails and routes and a mountain in front of us, we started up the hill but didn't get far before the 'toast people' started appearing below us. 'Toast people,' are the namesake Rachel explains, of climbers hiking in between routes, carrying their large square crash-pads upright with straps across their backs, the only thing you can make out of their huge rectangular forms are usually two little stick-like legs comically protruding and propelling the large toast looking creature up or down the terrain. Toast people have a difficult time hearing anything behind them, with basically a soundproofing wall on their backs. This makes conversations between Toast People or among Toast People pretty funny. Toast people are also victimized often by each other, in part of a game of sneak-up-and-yank-you-down-from-behind based on their turtle-like vulnerability. Toast people are also often accompanied by dogs, packs, jackets, chalk-bags and all manners of nalgenes and other accessories necessary for bouldering. Anyways these toast people had some familiar voices and some familiar faces and our groups were finally officially united. Introductions were made as informally as possible, with conversations being first and names occurring somewhere in between cheering for members attempting routes and discussing the next destinations in the area. The fading light only made that place more beautiful by the minute. The high rising jagged peaks of the Sierras cutting into the sky were dramatized but the sun's rays as it fell below the horizon behind them. The first star of the evening appearing in the space impossible to discern where the colors of dusk end and the night sky begins. Had the temperature not coincided with the rapidly diminishing light I'm sure we would have stayed out every night as late as we could. 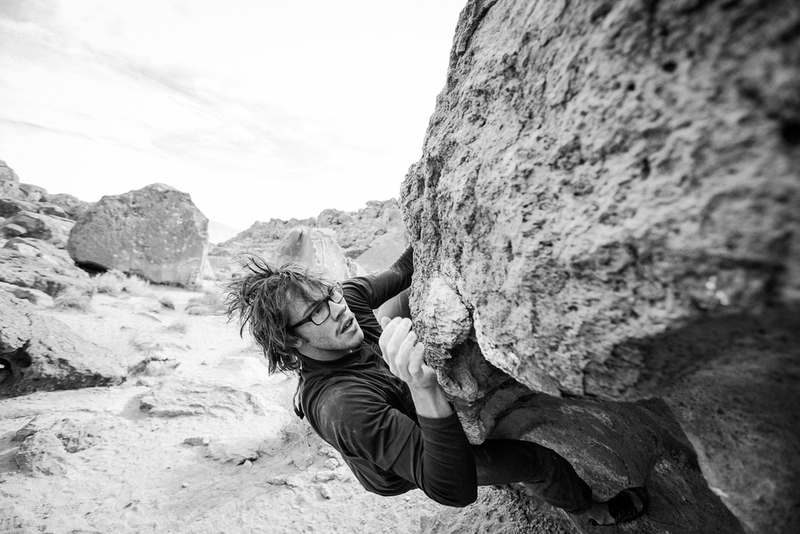 With a strobe and a few willing climbers I had a blast capturing the feel of a low light boulder session; As droves of other climbers slowly made their way out of the cracks and crevices of all the boulders and walls in the terrain around us. They start their engines and the ambiance hangs in the air as their headlights bob up and down illuminating the dust clouds kicked up on the narrow primitive road. Night comes and setting up dinner in the dark is made interesting by the 5 or 6 fearless kangaroo rats that accost us for crumbs falling from our makeshift pallet table. Beers are shared and the Sierra Nevadas become an entire horizon size wall paper, lit by the brightest moon I have ever seen in my life, making the fire seem almost dim as I stand at a distance and shoot photos and watch and wonder if it all is really happening. 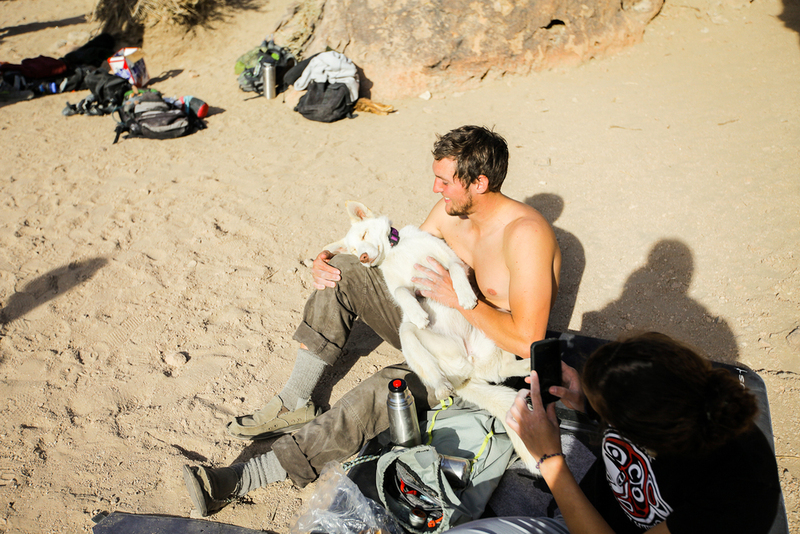 The next several days were spent rolling in the dirt, comparing onesies and/or footy pajama outfits, discussing the best areas of climbing for the day, hiking to said climbing areas and playing with Tikka, Will Moore's crag dog. The best part of Bishop I personally experienced was the community vibe. 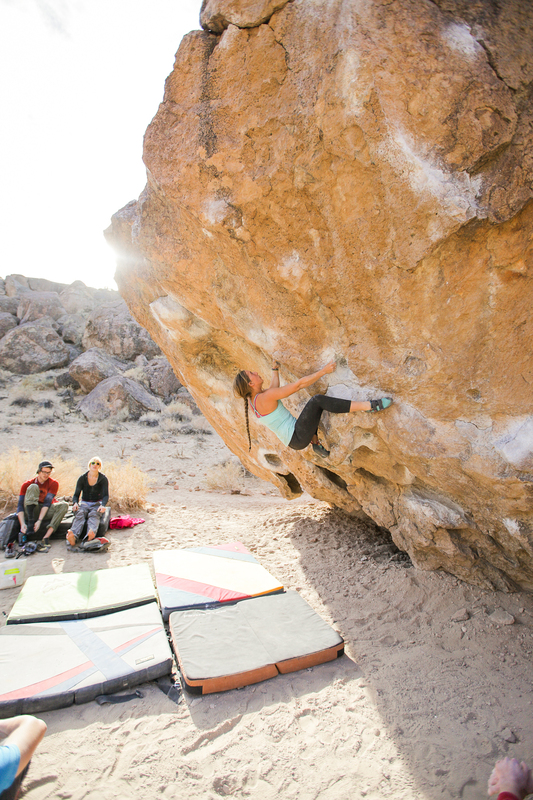 I am in no way experienced in bouldering but was overwhelmed by the amount of support and stoke everyone expressed at just extending the friendships and connections to mountain life. So many sincerely talented and even more sincerely humble people I have never encountered and it left all of us not wanting to leave, and planning our next trip before we even broke camp. 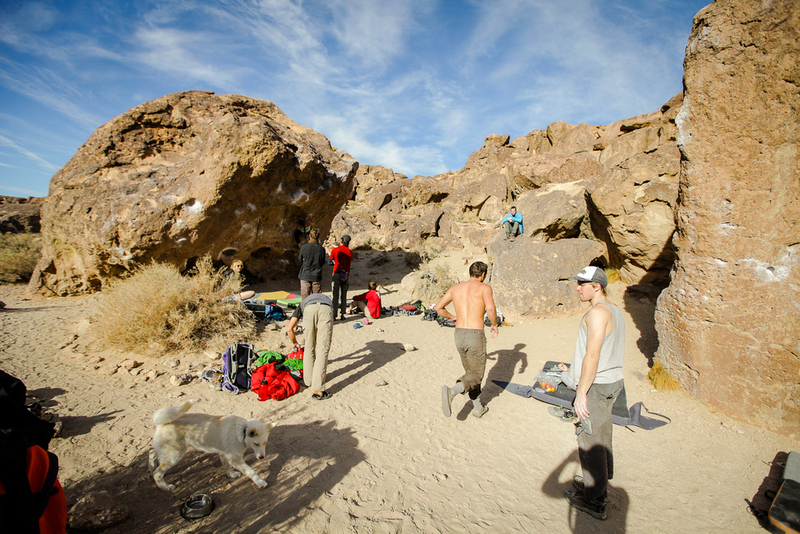 Shooting photos of climbers and bouldering left me with a new normal for ways to interact with athletes, how it really feels to be a part of a trip, and how the measure of accomplishment lies in so many more ways than whether or not I make images worthy of publishing. A good trip changes you and stays with you in ways that remind us why we are inspired, and why we want to make sure not to miss the next one.